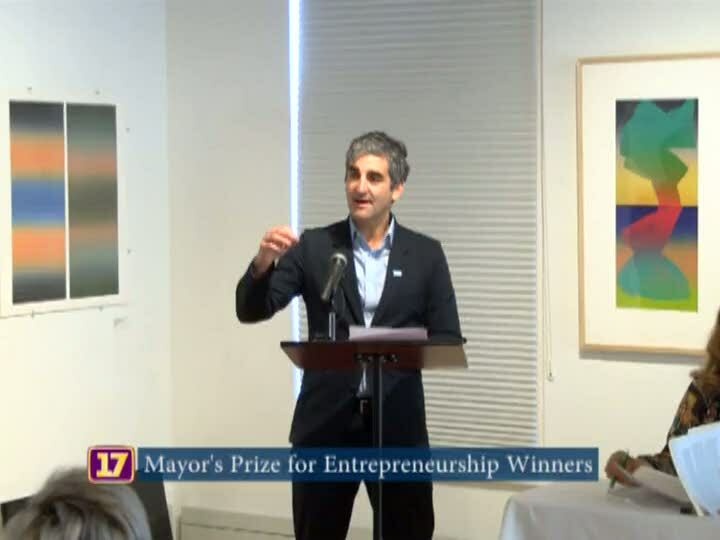 Mayor Miro Weinberger today awarded $100,000 in grants to help entrepreneurs start and grow more businesses in Burlington. Fully funded by the Ewing Marion Kauffman Foundation, the Mayor’s Prize for Entrepreneurship was first launched in October 2017 as a way to increase support for innovation and entrepreneurship in Burlington. This year's winners are the Generator, Center for Women and Enterprise, and Women's Small Business Program - Mercy Connections. Speakers are Gillian Nanton, Assistant Director of Burlington Community and Economic Development Office; Burlington Mayor Weinberger; Chris Thompson, Executive Director of Generator; Gwen Pokalo, Director of The Center for Women and Enterprise; Lisa Falcone, Executive Director of Women's Small Business Program - Mercy Connections; and Dennis Moynihan, Executive Director of BTV Ignite.